So at the very least, I invite you to spend a few moments this week thinking about some of the things that make you feel thankful. I’m thankful for all of the people who chose to spend a few minutes signing autographs for me. The number of cards arriving in the mail last week decreased as I’ve had less time to write letters, but I did get my first 2014 Topps Update cards signed. 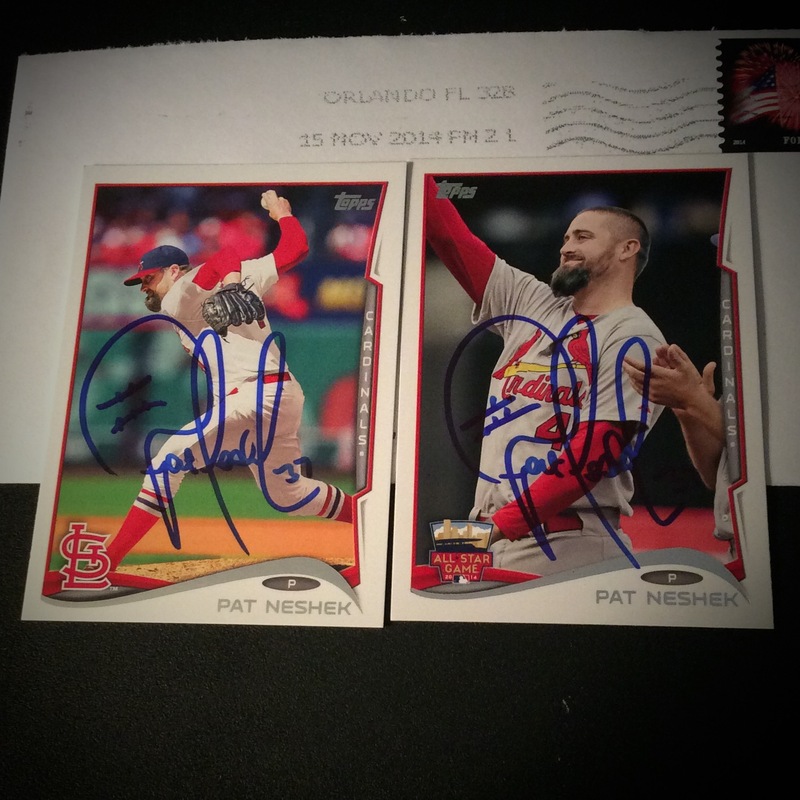 Until his All-Star selection this year, Pat Neshek probably had a bigger fanbase among autograph collectors than the fans of whichever team he happened to be playing for in a particular year. Neshek is among a small number of Major League Baseball players who collect cards, and the only one who will actually trade signed cards with his fans. 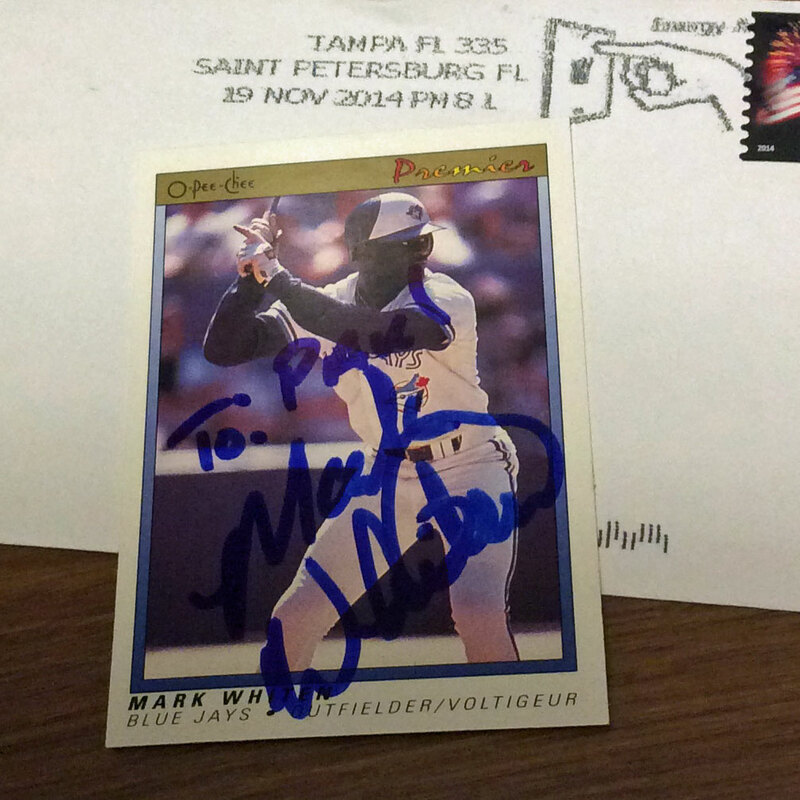 Outfielder Mark Whiten spent parts of 11 seasons in the Major Leagues from 1990-2000, and played for nearly as many teams. He remained active through the 2003 season, finishing his playing career with the Atlantic League’s Long Island Ducks. Whiten is most famous for tying a Major League record by hitting four home runs in one game. I will be back next Monday to continue showing off cool baseball cards and autographs, talking about interesting baseball happenings and waiting for baseball season to return. Until then, let me wish you a happy Thanksgiving.